Scenic Decor Deer Mailbox - - standard size curbside mailbox decorated with a buck deer. 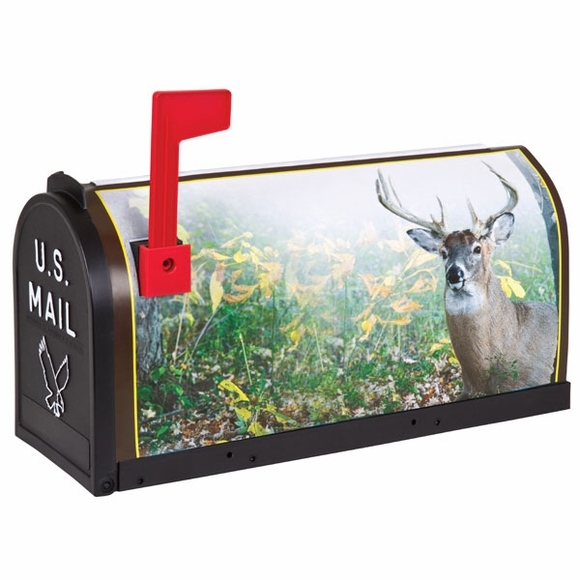 Black mailbox comes with a buck deer mailbox wrap and traditional red flag. Internal strut construction adds strength to the all plastic mailbox. The buck-deer scene is printed on a plastic slide-on insert and attached during production. Assembled with pre-drilled holes for easy mounting. Dimensions: 19.125" x 6.75" x 9.75". See Related Products for other Scenic Decor Mailboxes.